Can you spot the differences in these two pictures of Harvey? Answer at the bottom of the page! 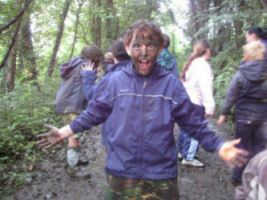 Go wild in our woods - In St Germans we've got a woods to have fun in. 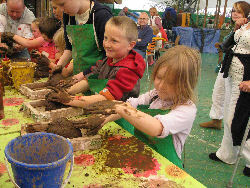 Make dens and mud pies, follow our nature trail, look for animal tracks or search for treasure. There are badgers, foxes, lots of different birds and you may even find deer tracks. Why not pick a flower bouquet, or collect leaves to make a collage. PS. It's not always muddy! Be the Fat Controller - In Harvey's garden we’ve got a signal box playhouse complete with a wooden train set for you to enjoy. Or if nature watching is your thing, then you get a great view of birds through the window. You can wave at the swings, sit on the balcony, or chalk up the latest train times on the signal blackboard. Go to the beach - If you're staying in Harvey then follow the old railway line footpath to the harbour and beach. The beach is three miles long and the sandy dunes are really good fun to jump down. 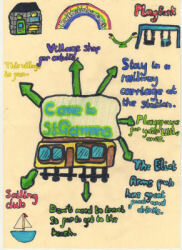 In the summer there are special places to go swimming with life guards to make sure you stay safe. We love cartwheeling in the sand and collecting little white Cay Cay shells. Our favourite beach near St Germans is Portwrinkle, but we also like catching the bus to Hessenford and walking to Seaton along the river path. If you like rockpooling, Portwrinkle is best. If you like playparks, there is a very good one at Seaton. 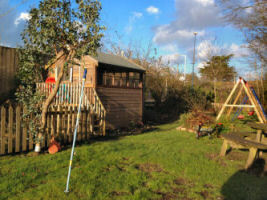 Get close up to nature - In Harvey’s big garden there is a wildlife pond - watch out for tadpoles and frogs. In St Germans you might like to check the bug houses for creepy crawlies or learn all about the moths that visit the station at night. You might like to explore our bug houses to see what you can find. In Harvey’s wildllife garden you can pick up our chestnut logs to see what is hiding below. 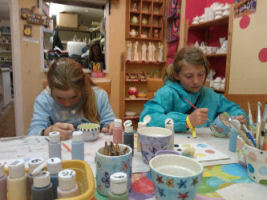 Visit Looe - There is an arcarde, lots of gift shops, a joke shop and a lovely beach. 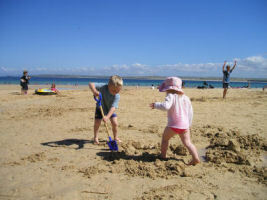 We like crabbing on the harbour wall or over the bridge beside the pedalo boats and play park. For crabbing advice there are tips on this link. Buy bait and buckets from Pengelly's fish shop or if this is closed a good place is Looe Chandlery, by the big carpark, where you can also buy surf wear and book fishing trips. By train change at Liskeard for the Looe branch line. It's a lovely ride with lots of river birds to see along the way. 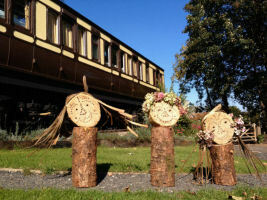 Visit Bodmin Railway - catch the train to Bodmin Parkway and you can go on a 13 mile trip on a steam locomotive through the countryside to Bodmin. 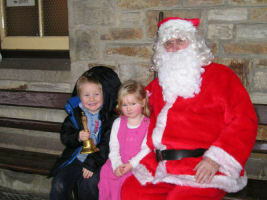 They do Santa specials in winter and while in Bodmin you can visit Bodmin Jail too. Visit the Eden Project - At Eden you can walk in the rainforest and learn all about tropical flowers and how things grow in other countries. The biomes are fun to explore, and there's the outside gardens, a big zip wire, ice skating in the winter and a cool learning bit. 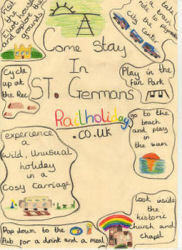 The bus goes from St Austell station, which is just a short walk from an amazing play park. Visit Paradise Park. They have lots of birds like owls and parrots, eagles and falcons. 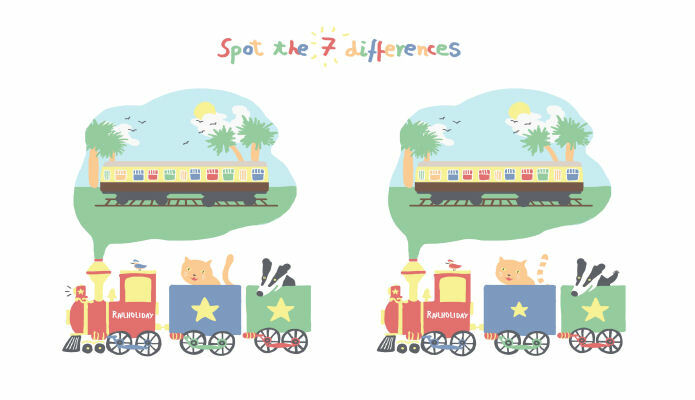 And there are otters, pandas, squirrels, alpacas, goats, sheep and donkeys and loads more. And you can go on a mini train ride around the park! Just walk up the hill from Harvey - it takes about ten minutes. National Geographic Kids - All about animals, nature and planet earth. 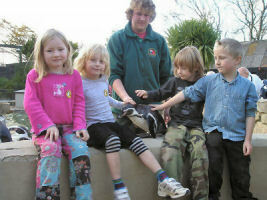 Fox Club - Cornwall’s very own wildlife club, full of fun and games. 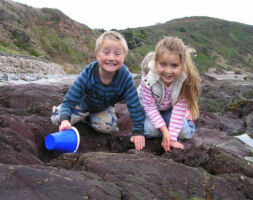 Eco Friendly Kids - a site with lots of tips for being eco friendly. Peer Trainer - Physical Fitness Resources for Kids - everything you need to get you fit and healthy. Have you a web site that would interest visitors to our site? If so then we would be pleased to set up a reciprocal link with you. 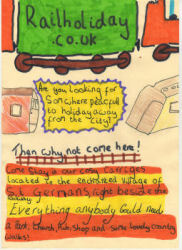 Click on this email link: Links@railholiday.co.uk.